Padalka served as commander of the Soyuz TMA-16M spacecraft that carried Kelly and Kornienko into orbit last March 27 and he plans to return to Earth aboard the same ferry ship Sept. 11 to close out his fifth space mission. When he lands next Friday, his total time aloft will stand at 878.6 days over five missions dating back to his first launch in 1998, more than two months longer than the previous record. Because Kelly and Kornienko are spending nearly a full year aboard the station, Russia launched a fresh Soyuz spacecraft Sept. 2 to bring them home early next year. On board for the spacecraft delivery mission were Soyuz TMA-18M commander Sergey Volkov, European Space agency astronaut Andreas Mogensen and Kazakh cosmonaut Aidyn Aimbetov. Mogensen and Aimbetov will join Padalka aboard the Soyuz TMA-16 spacecraft and return to Earth next Friday, officially bringing Expedition 44 to a close. Volkov will remain behind aboard the station as part of Kelly’s Expedition 45 crew and come home with Kelly and Kornienko next March aboard the Soyuz TMA-18M spacecraft. The station’s other three long-duration crew members — Soyuz TMA-17M commander Oleg Kononenko, Japanese astronaut Kimiya Yui and NASA astronaut Kjell Lindgren — were launched July 22. 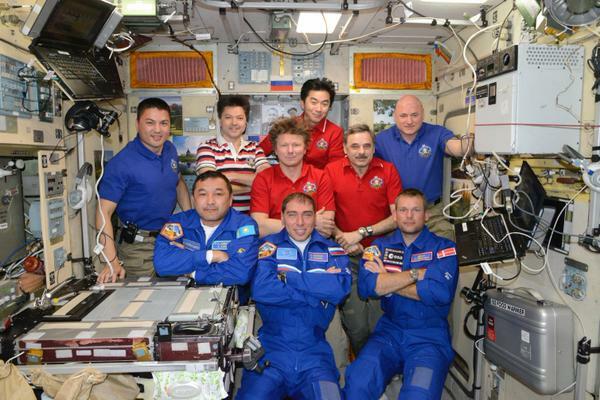 They plan to return to Earth Dec. 22, ending Expedition 45. 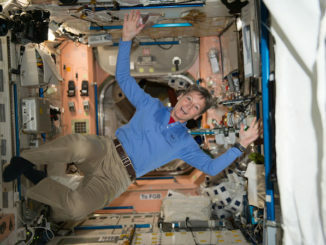 Kelly will remain in command of what will become the Expedition 46 crew. 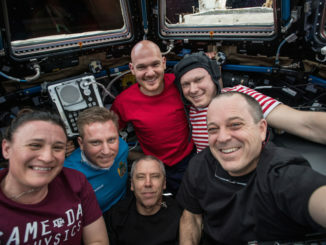 The station’s entire nine-member crew gathered in the Japanese Kibo module Saturday for the change-of-command ceremony, with Kelly and Padalka floating in the center of the roomy laboratory. 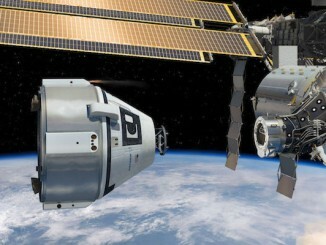 Padalka noted that not everything went well during his stay aboard the station, mentioning the April 28 failure of a Russian Progress supply ship and the June 28 loss of a SpaceX resupply mission.